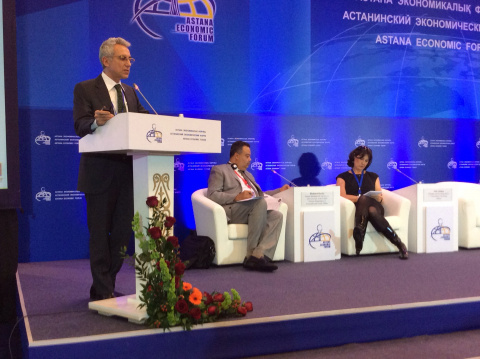 Ezio Lattanzio, Chairman of FEACO, attended the Astana Economic Forum on 21-22 May 2015. The main topic of the forum was "Infrastructure - a driver of sustainable economic growth". The Europe and Asia forum aims to kindle discussion around issues of the modernisation of public administration as well as the role of state institutions in stimulating innovation. A group of experts, heads of financial institutions and high-level statesmen have been examining how a partnership between Europe and Asia would ensure global growth and create a competitive ecosystem to support innovation efforts in both regions. Ezio Lattanzio, as representative of the management consulting industry, was invited to take part in the panel “Innovative solutions for financing sustainable development: the role of social media” during the session on “the role of the private sector in supporting sustainable development”. The Astana Economic Forum was organized by the Department of Economic and Social Affairs (UN) together with the Ministry for Investments and Development of the Republic of Kazakhstan, in collaboration with the OCSE and the World Bank.